Morley had trained dozens of Golden Eagles to hunt for the many films he produced for Walt Disney's Wild Kingdom, BBC, PBS and his own films through his company Tundra Films and that of his sons company Echo Films. 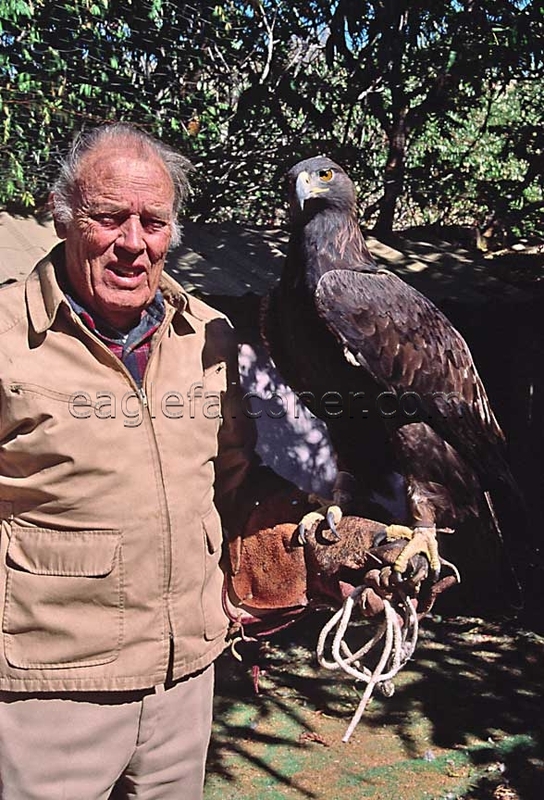 I made a further two more visits to Morleys home in the following years and we spent many happy hours on the escarpment of the Snake River Canyon or just sitting exchanging experiences with eagles. "One More Hero" by Alan Gates. "An American Experience" by Alan Gates. Morlan Nelson was a legend in his own lifetime, a war hero an excellent falconer, cinematographer and conservationist. To be superb in any one of these roles would be enough for most mortals but Morley (as he was known to his friends) was a leading light and pioneer in all of theses fields. I first became really aware of Morley through a dramatic clip of film that the BBC used in one of their natural history documentaries on Birds of Prey, narrated and presented by Tony Soper. That short piece of film showed a Golden Eagle in hot pursuit of a jack rabbit down a hillside and straight into the camera. It was presented as a wild eagle hunting for food but in reality was produced using one of Morley’s trained eagles by his families film company Echo Films. The impression that short piece of dramatic film made on me concentrated my mind to find and contact Morlan Nelson. Our correspondence started in 1990 but by 1995 I started to realised that letter writing was too slow a medium to learn from such a remarkable man. In September of 1995 I landed in Boise, Idaho, USA the home town of Morley Nelson with the sole intention of sitting down with the great man and talk eagles.